Thank you for the Opinion by Supervisor Lawson (July 11 Prince William Times) on the ADAMS mosque and Land-Use provisions in the Rural Crescent. We hope your readers would also like some objective information about this ‘septic vs sewer’ issue at the heart of this ADAMS Application. The approval of both Victory Crossing and Fireside Churches (and many others that were allowed County approval for sewer connection in the Crescent) is actually a correct precedent. Since St Katherine Drexel Parish and School never requested connection to public sewer, it was consequently never considered by County staff or the Board of County Supervisors and never denied, and cannot therefore be a precedent. As the Board admitted, every church application in the Rural Crescent that requested sewer connection has been approved; it is consequently likely any St Katherine’s request would also have been approved. ADAMS therefore had no reason to believe its application would not be similarly approved, as all these other churches had been. The 8-0 approval of the mosque application and the 5-3 vote approving the public sewer confirms ADAMS’ reasonable expectation of this approval. As we demonstrated time and again, ADAMS repeatedly sought neighborhood input and made substantial efforts to adapt its designs to accommodate neighbourhood input. When neighbours opposed the entry/exit to be from Schaeffer Lane, as the Country initially preferred, ADAMS worked with the County to change its plan and have all access into the site via Vint Hill Rd. When concerns arose over the potential for overflow parking, the design was changed to allow more parking spaces on the property to eliminate any potential need for offsite parking. When concerns arose on preserving the rural character and “look” for the property, ADAMS ensured the building height would be one story only (plus a very discreet dome well below height standards to preserve that rural character), would keep the maximum number of existing trees and shrubs, and would incorporate berms along the Vint Hill Road frontage to provide additionally screening and the view from any vehicles driving past. None of these accommodations were required. However, the desire to be a good neighbour far outweighed any inconvenience and cost to ADAMS that might accompany those changes. That same desire then motivated the decision to seek sewer, and the many “extenuating circumstances” of sewer connection decided ADAMS to seek that approval. In the Planning Commission meeting some months ago, Commissioner Alex Vanegas offered perhaps the definitive argument for allowing sewer. As Chair of the Prince William County Service Authority, which oversees the Service Authority’s comprehensive county-wide water and sewer system serving over 85,000 accounts for a population of over 250,000, Vanegas developed a unique professional expertise on these issues. As he noted, it is not a question of “IF” a septic system will fail, but rather “WHEN” it will fail! Vanegas also made clear that a septic system failure for an institution like ADAMS could be catastrophic for the entire neighborhood, as it would affect the groundwater supply for any neighbours on well water, thereby impacting every residence there. It is apparently already well-known that the soils in this part of the Rural Crescent and County are not highly conducive to septic systems. ADAMS’ team provided a map from the Prince William County Service Authority that showed properties in the Nokesville area that are connected to sewer. Many properties shown on this map were connected to sewer because the soils were not conducive to septic systems and thus a failure of the septic system occurred. This proves beyond any doubt that septic failure is obviously not an anomaly, but rather a significant issue in the Rural Crescent already. Moreover, the need for both a regular and reserve septic field on the property would necessitate cutting down many more trees, and reduce the tree save areas on the site. ADAMS’ current plan is over 70% open space with approximately 44% of the site being undisturbed. If septic were required, open space and save areas would be greatly reduced. As our mutual goal is to preserve the rural character of the Crescent, it is a major contradiction to require eliminating substantially more trees from any property. If this were a private residence for a single family of 5 or even 10 persons, septic should be acceptable. But for an institution that attracts some 200 persons every Friday afternoon, and can connect to existing sewer lines without disrupting any neighbours, the only environmentally safe course is sewer. In fact, the Board in the decision for Victory’s Crossing approval acknowledged that the on-site septic systems are ill-suited for church uses, which have erratic sewage systems uses. To say that allowing sewer connection will destroy the Rural Crescent is countered by the fact that so many properties, particularly institutions, have already been granted sewer, and yet the Rural Crescent still thrives. ADAMS has already made clear its desire to work with our neighbours and adjust our plans to help meet any reasonable concerns. But this is a two-way street. There is simply no sound reason to oppose the sewer. We therefore urge our neighbours to consider these facts and then help us to together find ways to make this environmentally safe property meet the needs and objectives of us all, without ignoring those facts. Let us work together without fear, and with maximum goodwill, for all PWC residents! Religious freedom is a constitutional protection that I value for all Americans. On Friday Jul 7, 2017, members of AIA, ADAMS and Dar al Noor, and many hundreds of others from across Northern Virginia attended funeral services in Manassas for Suzanne Miller, wife of VA Delegate Jackson Miller. Jackson has represented the 50th District, encompassing Manassas and surrounding area, in the Virginia House of Delegates since 2006, and is currently the Majority Whip. Suzanne, 45, succumbed after a long battle with cancer. Jackson is well respected on both sides of the aisle, and his House and Senate colleagues came out in force to support him at the funeral services. But even more important for the AIA community, Jackson Miller has been a steadfast friend of not only Dar al Noor and its members, but of ADAMS and the entire VA Muslim community. Jackson once told me his mother worked with students from the Middle East studying at US Colleges and Universities. As a result, he had lots of contact with young Muslims, and was proud to call many his friends. He renewed those ties in all dealings with the Muslim Community in both PWC and Fairfax, and was a frequent visitor and guest at mosques in the region. We were all proud to have Jackson as our friend and supporter. This was particularly key in 2012, when the House was considering a bill to prohibit application of any foreign Law for any citizens (individual or corporate) of Virginia. ADAMS and Dar al Noor had developed a coalition of support from the American Jewish Committee, B’nai Brith, the Interfaith Council of Virginia, other Christian churches and faith groups, and from the Northern VA Technology Council, the VA Chamber of Commerce, Smithfield Ham Corporation, and others who realize this Bill would impose undue burdens on many Virginians with any commercial or personal ties overseas. In the Subcommittee Hearing, Delegate Miller took the lead, posing insightful and forceful questions to the Bill’s sponsor to ascertain the point of this proposed Bill. When the Sponsor was unable to offer convincing answers, Jackson pressed home, noting that any proposed legislation is usually to deal with specific problems or problematic issues; however, he could see no problem whatsoever that this Bill would resolve. If fact, he pointed out this entire effort seemed like “a solution in search of a problem”. Jackson’s questioning was a tipping point, and other Delegates also saw the obvious lack of benefits and potentially negative consequences. The Committee chair was even inspired to note the overseas adoption of his own children would become illegal in Virginia under the terms of this new Bill. The opposition of the various groups in the Coalition was powerful, but Jackson’s brave opposition was critical in sowing doubt among his House colleagues, to therefore require another hearing, where Jackson’s opposition was instrumental in the vote to return the Bill to its author for re-consideration. Many other state legislatures have passed similar laws without the questioning or spirited opposition of individual legislators like Jackson. His very courageous public stance encouraged many other Delegates in his own Party to not only oppose that Bill in 2012, but to ensure it would not be raised in subsequent General Assembly sessions. Prior to that 2012 Session, Jackson had had very little contact with the Muslim Community in PWC, or any personal relationship with our leaders. Yet, he did what was right, and became a key leader in the fight to ensure against such discrimination. For all this, as well as his continued support and open friendship since then, AIA 2020 wants to show our appreciation and gratitude, and most important, our sincere condolence on the passing of his wife. We therefore ask you not only to Thank Delegate Miller by LIKING this page, but to send your own message of condolence to Jackson’s family on the passing of his beloved wife and their beloved mother. Hope everyone had a great 4th of July. My Family and I were in a 4th of July Parade in Purcellville, VA. My Boys were a part of the Boy Scouts of America Honor Guard with the US Flag and we were a part of the Purcellville Rotary Club Float. I remind all of us to take a moment on The 4th of July to remember Independence Day and what it means – Freedom, Democracy, Hope. On this special day we thank our Lord, Who created all people equal and for granting us with exceptional liberty in our beloved country, the United States of America. Please say a Prayer and Thank God for the Blessings we have in this Great Land of America. Let us recommit ourselves to service to our Country. Let us recommit to more Community Service, Interfaith Collaboration, and Civic Engagement. In 1492, Columbus had two captains of Muslim origin during his first voyage, one named Martin Alonso Pinzon the captain of the Pinta, and his brother Vicente Yanex Pinzon the captain of the Nina. They were wealthy expert ship outfitters who helped organize Columbus’ expedition and repaired the flagship Santa Maria. The Pinzon family was related to Abuzayan Muhammad III, the Moroccan Sultan of the Marinid Dynasty (1196-1465). Approximately, 30% of Enslaved Africans brought to America during the Slave trade were of Muslim background. We all know about the famous story of Kunta Kinte in Alex’s Haley book Roots. In 1767, Kunta Kinte was captured and enslaved. Kunta Kinte was a Muslim born in 1750, in the village of Juffure in Gambia. He was shipped to Annapolis, Maryland on the ship Lord Ligonier and sold to a Virginia planter. Kunta Kinte fought hard to hold on to his Islamic heritage. Having learned the Qur’an as a boy Kunta scratched Arabic phrases in the dirt and tried to pray every day after he arrived in America. Research has revealed that Muslim Veterans and people with a Islamic last name have participated in the different wars America has engaged in over the years. The United States Armed Services records confirm this fact, particularly during the Revolutionary War, the War of 1812, the Civil War, World War I, and World War II. On June 17, 1775, Peter Salem (Saleem) born (1750?-1816) a former slave who fought in the Battle of Bunker Hill. Peter Salem got awarded for fighting in the Revolutionary War, and he also fought at Lexington. Peter Salem and Salem (Saleem) Poor were honored for their bravery. History reports that a Jewish man told the people that the word was like “shalom” which means peace. The name for peace in Arabic is Salaam and Saleem in Arabic means one who is peaceful. Postage stamps have been made of Peter Salem and Salem Poor as American Revolutionary war heroes. From 1774-1783 there were at least six people with Islamic names who fought in the Revolutionary War as colonial soldiers. One of them was Yusuf Ben Ali, also known as Joseph (Benenhali) Benhaley, who fought with General Sumter in South Carolina. After the war, General Sumter took Joseph Benhaley with him inland to Stateburg where they settled down. Joseph Benhaley’s name appeared in the 1790 census of Sumter County. Revolutionary records also show that there was a Bampett Muhamed who was a Corporal in the Revolutionary Army, from 1775-1783 in Virginia. Francis Saba was listed as a sergeant with the Continental Troops in roll 132, 1775-1783, and Joseph Saba was listed as a Fifer in the Continental Troops roll 132, 1775-1783. 1864-1865 Max Hassan was another Muslim from Africa who fought in the Civil War. His war record shows he came from Africa and worked as a porter in the service. From the Foundations of America to over 7 Million American Muslims today, we all know many famous American Muslims like Muhammad Ali, Kareem Abdul Jabbar, Hakim Olojuwon, Shaquille O’Neal, Jermaine Jackson, Mos Def, Ahmad Rashad, Janet Jackson, Dr. Oz, Ice Cube, Ellen Burstyn, Aasif Mandvi, Dean Obeidallah, David Chappelle, Congressman Keith Ellison, and Congressman Andre Carson. The roots of Muslims in America are represented in more than 500 names of places, villages, streets, towns, cities, lakes, rivers, etc . . . in the United States in which there name are derived from African, Islamic, and Arabic words. Places like Mecca, Indiana; Morocco, Indiana; Medina, NY; Medina, OH; Medina, TX; Toledo, OH; Mahomet, IL; Mahomet, Texas; Yarrowsburg, MD; Islamorada, FL, and Tallahassee, FL are found throughout America. I am an American Muslim and I am proud to be an American. STERLING, Virginia — Lt. Governor Ralph Northam visited the All Dulles Area Muslim Society (ADAMS) Friday, June 2, along with other elected leaders to present a House Joint Resolution that honors the ADAMS Center’s FAITH Social Services program. House Joint Resolution 969 was approved by the General Assembly this year after being introduced by Delegate Jennifer B. Boysko (D-86). As Alliance for an Indivisible America 2020 Executive Director Robert Marro gave an opening introduction, ADAMS congregation members and the ADAMS Board gathered along with their community members and neighbors to watch FAITH Executive Director Ambreen Ahmad and FAITH President Tanveer Mirza receive the award on behalf of ADAMS. “We watched an election in 2016 that was based on hatred, bigotry and discrimination. That’s not what Virginia is all about. I came today to thank you for what you offer to our community and what you offer to this country,” Northam said to the congregation as they gathered for the award ceremony. Nokesville — Prince William Board of County Supervisors voted to approve the construction of a new ADAMS’ mosque branch following a hearing held Tuesday evening June 27. The Mosque branch will be located in the Nokesville area of Prince William County. The hearing held at the James McCoart Building in Woodbridge was attended by about 500 members of the ADAMS Greater and Western PWC congregation. A smaller number of Gainesville and Nokesville residents, many members of the group Friends of the Rural Crescent Energized (FORCE) also attended the public hearing that night, most to oppose the new mosque. Opponent concerns focused on increased traffic and that allowing the mosque branch to connect to the public sewer would allow large corporations and institutions into the Rural Crescent as well. Dozens of mosque supporters spoke to mitigate those concerns explaining that mosque traffic would only be for Friday mid-day prayers. Mosque visits in morning or evening rush hours are almost non-existent. The prayer services will be at noon time on Fridays only, well after morning rush hours, and will end before afternoon school release times. Traffic concerns are therefore irrelevant to the Application. Proponents also addressed the sewer connection issue. They pointed out that the PWC Board had previously approved churches in the Rural Crescent to connect to public sewer. No application for a religious institution had ever been denied a request for sewer connection, and many of those churches had significantly larger buildings and worshipper capacity. ADAMS supporters presented a map of many plots in the Rural Crescent that had already been connected to public sewer over the past years, without destroying the character of the Crescent. One speaker noted how a PWC Planning Commissioner, a water treatment specialist by profession, had himself noted in the Planning Commission hearing that public sewer was the only environmentally reasonable and safe option for this property. Two opposition members also noted the “true threat” of allowing groups with ties to terrorism and terrorist groups to have a facility in PWC. These allegations were roundly criticized even by members of the opposition to the mosque, though they were sadly emblematic of the many letters sent to ADAMS by individuals expressing similar views. More than 175 persons signed up to speak, so the public hearing extended well through the night and into early morning. After the nearly 8 hours of public hearing and discussion, the PWC Board voted on two separate motions: the first to allow the mosque to be built there (which passed unanimously 8-0), and then to allow ADAMS to connect to public sewer (passed 5-3). Despite the late hour (3:30 AM), hundreds of supporters and many dozens of opponents remained in the Auditorium to witness the final result. Supervisors Jeanine Lawson (R-Brentsville), Pete Candland (R-Gainesville) and Ruth Anderson (R-Occoquan) voting in favor of the mosque but against the connection to public sewer line. Board Chairman Corey Stewart (R) and Supervisors Maureen Caddigan (R-Potomac), Marty Nohe (R-Coles), Frank Principi (D-Woodbridge) and John Jenkins (D-Neabsco) voted in favor of the mosque and in favor of the sewer connection. The application for this new ADAMS branch began about three years ago to accommodate the Muslim population in western PWC. Dar al-Noor (Hoadly Rd, Woodbridge) is currently the only mosque that can manage larger crowds in PWC. This is not the first opposition to an ADAMS mosque in NoVA: the application to expand its Ashburn branch last year also faced considerable resistance, but was similarly resolved when the Loudoun Board of Supervisors voted to grant ADAMS the permit earlier this year. The ADAMS leadership and the entire ADAMS – Greater Gainesville community applaud all the PWC Supervisors for their support of the ADAMS mosque and their obvious strong commitment to religious freedom. 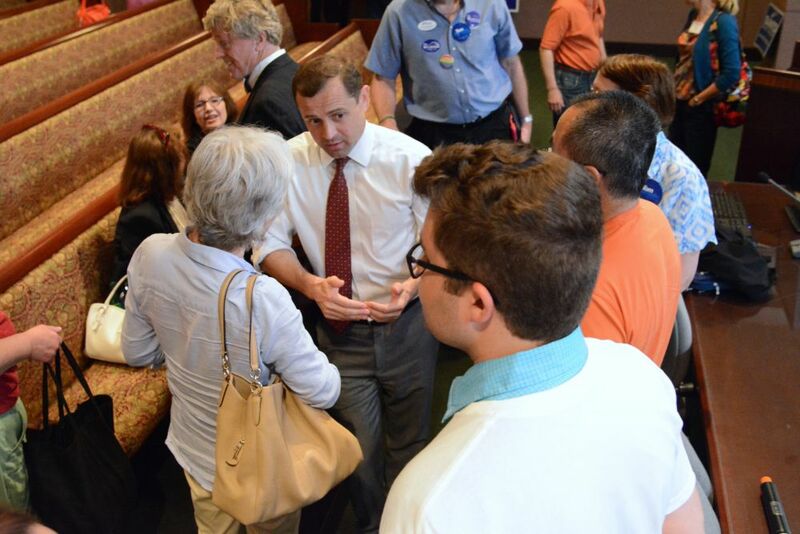 Both candidates seeking the Democratic nomination for governor visited Loudoun this week. He also remarked on a recent Washington Post poll that showed him with a narrow lead over his opponent in the primary race, pediatric neurologist and Lt. Governor of Virginia Ralph Northam. Perriello and Northam have polled closely together. Northam visited the All Dulles Area Muslim Society Center in Sterling along with other elected leaders Friday morning to present House Joint Resolution 969, which the General Assembly adopted this year. That resolution, introduced by Del. Jennifer B. Boysko (D-86), honors the ADAMS Center’s FAITH Social Services program. Perriello and Northam will face off in the Democratic primary election on June 13; whoever wins will be Democratic nominee for governor in November. Arlington National Cemetery, VA — Members from the Muslim American Veterans Association (MAVA), the Boy Scouts of America, the All Dulles Area Muslim Society (ADAMS), Masjid Muhammad – the Nations Mosque, the Dar al Noor Islamic Community Center and the Alliance for an Indivisible America (AIA 2020) gathered Saturday at Arlington National Cemetery to memorialize those who gave their lives in service of their country. The Muslim veterans, representing all branches of the service, included a former paratrooper who served with the 101st Airborne in Vietnam in 1967 and with the 82nd Airborne in Fort Bragg in 1968, and a Bronze Star awardee who served with the US Army in Iraq. All the American Muslim veterans noted their great pride in having been part of a long tradition of service to America. The group placed flowers on headstones, paid their respects to others visiting the National Cemetery and offered prayers led by Stanley Mahdi, Commander, MAVA Post#1 Washington, at grave sites of the fallen, including the grave of Staff Sergeant Ayman A. Taha, a member of the ADAMS congregation who was killed in Iraq in 2006 while preparing a munitions cache. “We felt a strong and special spirit here in Arlington. Our hope and prayer is that that spirit grows stronger everyday and is felt everywhere across our great country,” said Lyndon Bilal, National Commander of MAVA. The American Geriatrics Society (AGS) has named Fatima Sheikh, MD, CMD, MPH, Medical Director at FutureCare in Maryland and Assistant Professor at Johns Hopkins University School of Medicine, the 2017 AGS Clinician of the Year. In her work across post-acute and long-term care, Dr. Sheikh is recognized not only as a skilled physician serving the needs of particularly frail older adults in the Baltimore area but also as a dedicated mentor for a diverse and growing interprofessional team. Daughter of ADAMS community member Tanzila Sheikh, Dr. Fatima Sheikh was honored at the AGS 2017 Annual Scientific Meeting (May 18-20 in San Antonio, Texas). With a professional interest in improving long-term care for residents of skilled nursing facilities, Dr. Sheikh has championed several programs at FutureCare for managing multiple chronic conditions and transitions to and from the hospital–both critical components of long-term care for older adults. In 2012, for example, Dr. Sheikh played a key role to establish the Johns Hopkins Community Partnership Skilled Nursing Facility Collaborative, one of five Johns Hopkins University community health projects funded by the Centers for Medicare and Medicaid Services Innovation Center. And as these programs enhance the broader setting for geriatrics expertise, Dr. Sheikh has remained equally committed to high-quality care as a clinician and a mentor. Dr. Sheikh is recognized for her skill in conducting Advance Care Planning–an innovative service for documenting care preferences and one only recently recognized for Medicare beneficiaries. She continues to work with colleagues and fellows from the Johns Hopkins University School of Medicine on the nuances of geriatrics care, particularly when it comes to navigating cultural competency for diverse older adults and their families. Dr. Sheikh has been a member of the AGS since 2011, when she first began her fellowship in geriatrics. She is board-certified in internal and geriatric medicine, and continues to balance her clinical career in geriatrics with research on health system innovation and improvements to care quality. The AGS Clinician of the Year Award recognizes exceptional health professionals who deliver outstanding care to older adults and who model the importance of geriatrics for our country’s growing older adult population. It is one of several honors conferred by the AGS at its Annual Scientific Meeting–held this year in San Antonio, Texas., May 18-20. The 2017 award recipients include more than 15 healthcare leaders representing the depth and breadth of disciplines championing care for older adults. For more information, visit AmericanGeriatrics.org. The AGS Clinician of the Year Award was established to recognize the contributions of practitioners to quality health care for older people and the importance of the geriatrics clinician in our healthcare delivery system. Through awardees’ efforts, scientific advances are integrated into the practice of geriatrics, resulting in improved well-being and quality of life for older adults.